Rapid prototyping and rapid manufacturing compared to traditional mold manufacturing advantages. Rapid prototyping technology is not limited by the structure and shape of the product, it’s involved in metal prototyping, not only plastic. Any complex shape and structure, as long as the CAD data, can be easily completed, so give personalized, customization provides the possibility; And the use of rapid prototyping technology and Rapid manufacturing technology, do not need to open the mold, to achieve a moldless manufacturing, can make the cost of new product development down to the traditional way 1 / 3-1 / 5, cycle shortened to 1 / 5-1 / 10. Coupled with the rapid prototyping and rapid manufacturing equipment can be achieved most of the unattended, 24-hour continuous processing, also for manufacturers to save labor costs and improve production efficiency. Rapid prototyping and rapid manufacturing technology can be used throughout the product design, development, trial production, small batch production and other aspects, and whether it is industrial manufacturing, education, medical field, cultural relics protection field or other areas, up to an aircraft, small to a ring, as long as the need for physical proofing or trial production, you can use rapid prototyping and rapid manufacturing technology, the application is very wide. 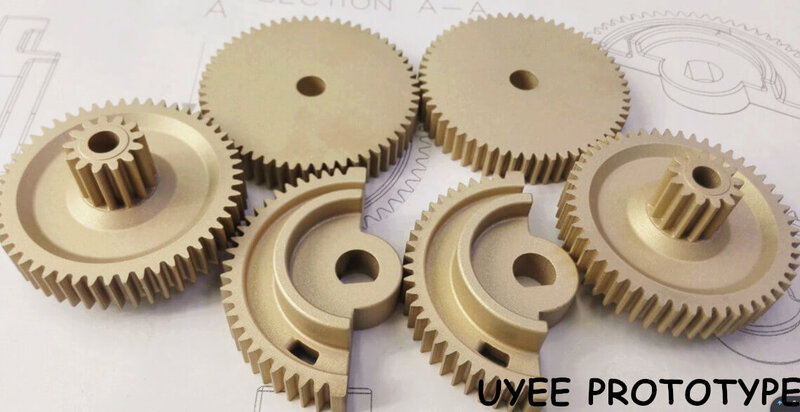 Rapid prototyping and rapid manufacturing of the latter part of the auxiliary processing capacity is greatly reduced, to avoid the outsourcing of data leakage and time span, especially for some high confidentiality of the industry, such as military rapid metal prototyping, nuclear power field. 3D printing technology “print” products are naturally seamless, one piece, the stability between the structure and the connection strength is much higher than the traditional method. In industrial manufacturing, CNC machining has become the mainstream of rapid prototyping methods, but from a professional point of view, there are some differences between them. Otherwise, in the rapid prototyping (RP) and CNC processing characteristics of the comparison. RP and CNC loyal supporters are focused on their favorite technical advantages, the understanding of these two skills is the right to pick the key to processing tools. Over the past fifteen years, the prototype imitation has made significant development. Start, Most RP skills have a significant advantage in terms of speed, but because of the limitations of accuracy and material functions, the further development of the skills is constrained. Since the RP presented in the future, because of some of the competition threatened, CNC in the speed to be changed, but also bring the well-known benefits. The same RP in the accuracy, material function and appearance polishing, etc. have also been improved. Knowing these two skills is especially important for picking up the right thing for the job. First, it’s about the material. RP processing skills to a large extent be constrained; processing of raw materials developed a very long process. The size of the material selection becomes larger and the function is also secured. Now available materials are metal, plastic, ceramics and composite materials, but the selection of materials is still subject to some constraints. Moreover, most of the material function and material processing, molding and casting and other aspects of the function is not very match. In contrast, CNC machining skills are not subject to any constraints; machining process for all the materials can do cutting disposal. Second, the maximum scale of the workpiece is 2200 x 1300 x 800 mm. Although the existing industrial equipment can not process the instrument panel, the existing prototype can be used to produce most of the daily Department stores and industrial products. If the equipment to produce parts too large, you can first produce its various components, and ultimately re-form a good component. It is important to note that the scale has an impact on time, making larger parts takes longer. CNC machine processing the use of a wide range of scale, can produce aircraft parts; CNC machining can be produced in the practice of parts and modules of the scale, small to desktop Equipment to bridge equipment. It can be said that the constraints of the CNC scale only come from the mechanical things used. In the end, it is due to the degree of clutter of the machined parts; the degree of clutter processed by the RP is substantially unconstrained; if a sample is to do with the design software to do the case, then the production of time or cost is simply not affected. Agile, cheap production of chaotic parts is one of the biggest advantages of RP. However, CNC machining is constrained; CNC machining is necessary to dispose of prototype metal parts.